In order to run, the V-Ray license server requires that a USB hardware lock (dongle) is attached to the computer where it is running. The dongle contains information about the number of available licenses for V-Ray. You can attach more than one dongle to the same machine to increase the number of availabe licenses. Before using the dongle, you must install a driver for accessing it. For more detailed installation and trouble-shooting instructions, please check the installation PDF guide. 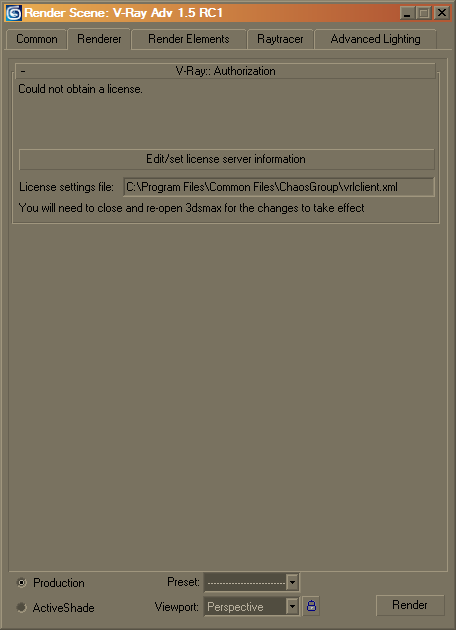 All of the settings for the license server are saved in an .xml file vrlservice.xml which is placed in a ChaosGroup directory located in the Common files directory provided by Windows, which is typically found in the Program Files directory. Thus usually the full name of the settings file is C:\Program Files\Common Files\ChaosGroup\vrlservice.xml. In case of any problems the user can edit the file directly, but we strongly recommend that, unless the user is experienced, they should not do so. When you open the Render Scene dialog inside 3ds Max and choose the V-Ray renderer, press the Edit/set license server information button in the Authorization rollout. 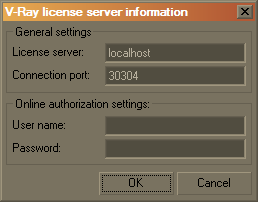 It will prompt you for the license server name or IP where the V-Ray license server is running. Leave the User and Password fields blank. You need to close and re-open the render scene dialog to see the changes. Note that if you are running the V-Ray license server on a different machine, you do not need to install the WIBU-key dongle drivers on your workstation. All of the V-Ray client settings are saved in the vrlclient.xml file in the Common Files\ChaosGroup directory which is usually located in the Program files directory. Thus the full file name of the settings file usually is C:\Program Files\Common Files\ChaosGroup\vrlclient.xml. It can be edited by hand but we strongly advise you not to do so, unless you are certain of what you are doing. Although V-Ray does not require a separate license to render through backburner, it does require access to the V-Ray license server. The same is true for distributed rendering. 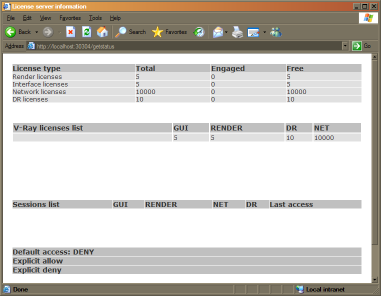 After you install V-Ray on the render slave, you must tell it where to look for the V-Ray license server. If 3dsmax is also licensed for that machine, you can use the Render Scene dialog as described above. 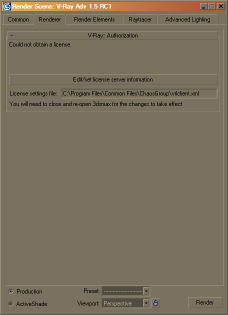 If a 3dsmax license is not installed on the render slave, you can use a small external program which is accessible from the start menu if you used the V-Ray installer (Start menu > Programs > Chaos Group > V-Ray for 3dsmax > Licensing > Administration > Change V-Ray client license settings) or from the <maxroot>\V-Ray folder if you installed manually from a .zip file. This program can also be run from the command line (use -help option to see usage notice). After installing V-Ray, plug your V-Ray dongle into a free USB port on your computer, if you have not done so. Start the V-Ray license server (Start Menu > Programs > Chaos Group > V-Ray for 3dsmax > Licensing > Launch V-Ray license server). It may take a few seconds for the license server to start completely. Afterwards run 3dsmax and open the Render scene dialog. Press the Edit/set license server information button. 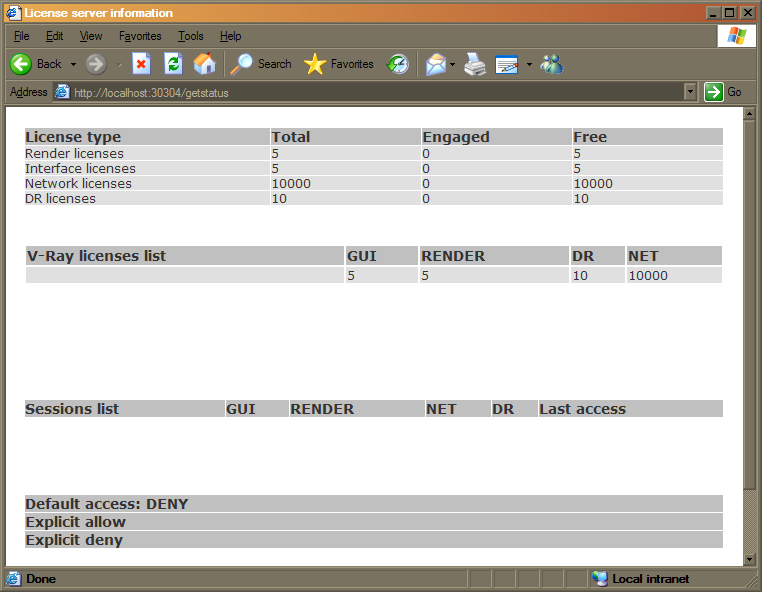 Enter the "127.0.0.1" IP address as your license server. Close and re-open 3dsmax. Now V-Ray should be running fine, provided that no other V-Ray copy is connected to your computer. If you wish to start the license server automatically, use the shortcut from the start menu to register the V-Ray license service (Start Menu > Programs > Chaos Group > V-Ray for 3dsmax > Licensing > Administration > Register V-Ray license service). Install the V-Ray license server and the WIBU-key driver on a suitable machine in your network (typically this would be a server machine). Plug the dongle into a free USB port on that machine and start the V-Ray license server. Afterwards run 3dsmax on any computer in your network and open the Render Scene dialog. Press the Edit/set license server information button. Enter the IP address or the name of the computer where you have the license server installed. Close and re-open 3dsmax. Now V-Ray should be running fine, provided that the total number of running V-Ray copies does not exceed the number of granted licenses for the licensing server. Please check the installation PDF guide for more detailed infromation and trouble-shooting instructions. Send us an email to vray@chaosgroup.com if you need assistance.